The Queen sits with us for an interview. London, England – Who says persistence doesn’t pay off? After many repeated requests for an exclusive interview with the Royal Queen of England, she finally graciously agreed to grant us permission to ask her a few questions. Enjoy! 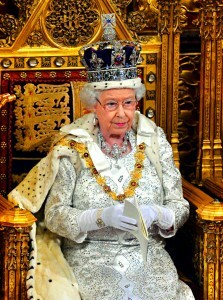 FM Observer: You’re known to many as Queen Elizabeth II. What is your actual full name? Her Majesty: My real name is Elizabeth Alexandra Mary Windsor. FM Observer: Is that the name on your passport? Her Majesty: Actually, I don’t have a passport. FM Observer: Do you have any favorite nicknames? Her Majesty: Oh, probably Lillibet, which is short for Elizabeth. FM Observer: May we call you Lillibet? Her Majesty: No, you may not. FM Observer: What about this one: When is your birthday? Her Majesty: I have two birthdays. April 21, 1926 is my actual birthday, however it is celebrated on the second Saturday in June. This is called the Trooping of the Colours. FM Observer: Well, that certainly makes a lot of sense. We’ve heard that you can order a dark beer in eleven languages. Just for fun, how would you say it in…French? Her Majesty: Je voudrais un biere brune, s’il vous plait. FM Observer: Very impressive. So, do you actually want a beer? Her Majesty: No, of course not. FM Observer: They describe you as a constitutional monarch. Is that some sort of butterfly? Her Majesty: Are you serious? Is this interview almost over? FM Observer: Hey, I’m asking the questions here. Who was your Daddy and what did he Do? Her Majesty: His name was King George VI and he was the King of England. I have been Queen since February 6, 1952, ever since he died. FM Observer: What is your husband’s full name? Her Majesty: That would be Prince Philip, the Duke of Edinburgh. FM Observer: Is it true that both you and your husband, Prince Philip are great great grandchildren of Queen Victoria? Her Majesty: Yes, that is true. Why do you ask? FM Observer: So, would it not also be true that both of you share Queen Victoria as your great great grandmother? Her Majesty: Yes, that is also true. Where are we going with this? FM Observer: Well, then, since you are a direct descendant of Queen Victoria’s oldest son King Edward VII, and since your husband, The Duke of Edinburgh is a direct descendant of Queen Victoria’s third child Princess Alice, then would not that mean that you married your third cousin?! Her Majesty: What?! Was this whole interview a set up so you could accuse me of an incestuous marriage? FM Observer: OK, since we seem to have hit a sensitive hot button issue, let’s wrap it up with one final topic. You seem to like dogs. More specifically, the Corgi breed. What are the names of some of your favorite Corgis? Her Majesty: Gloin, Gizzard, and Puke. FM Observer: How did you come up with those names? Her Majesty: From trying to describe my feelings after doing interviews like this one. Good Day!